Children love to play dress up; costumes help children to take amazing journeys in their imaginations. Even something as simple as a fantastic hat can be enough to fuel a child’s flight of fancy. You don’t have to spend a lot of money to help your child come up with a great costume. Cleverly repurposed or rescued materials make great props to help your children have a great time. You can create a great knight’s costume with a few simple materials. A cereal box can make a great shield. First, help your child to break the box down so that it is completely flat. Next, carefully cut a section to an appropriate size. Use duct tape to make a handle for the shield, carefully layering the tape so that the sticky sections are covered up; leave a small section of the adhesive end uncovered on each end so that you can attach the handle to the cereal box shield. 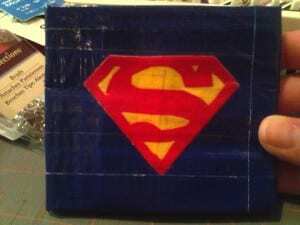 If you want, you can cover the shield in duct tape to hide its humble origins. For armor, you can also use cardboard boxes, though you’ll probably need a bigger box than a cereal box. You’ll also need some string, a can of soup, a sturdy hole punch, a spray bottle and either spray paint or duct tape. Cut out two sections of cardboard that are about as large as your child’s torso. Cut out two smaller pieces for the shoulder pieces. Spray a fine mist of water onto these pieces, and then shape the damp pieces around your soup can. While these pieces dry, punch holes in the top of the chest and back piece near where your child’s shoulders would be. After the shoulder pieces dry, punch holes in either end of them. Use your string to tie all of the pieces together; finally, make the armor silver by either covering it in duct tape or spraying it silver. To complete the outfit, give your child an old wooden or metal bowl to use as a helmet and a cardboard paper towel tube as a sword. Children love to pretend to be superheroes. You can help them create their own secret identity with a little bit of creativity. First, every superhero needs a helmet. This can be as straightforward as an old bicycle helmet or as crafty as a custom-made helmet built from cardboard and milk jugs. An old pair of goggles or safety glasses will help your child to conceal her identity. To make her personalized costume, attach strips of colored duct tape to an old set of clothes. You can add a monogram, give your child a set of racing stripes, and more. If you’re feeling creative, cut the strips into fanciful shapes before attaching them to the costume. Finish off the costume with an old bath towel or table cloth for a cape.